This is one of those things that you have to have if you're going off road. The OEM front differential cover is soft steel and the lip is vulnerable to even slight impacts on rocks. Protecting the cover and silicone seal is as critical as the 4-wheel drive option on your truck. The Carli Suspension Front Diff Guard is one of those things that you have to have if you're going off road. The OEM front differential cover is soft steel and the lip is vulnerable to even slight impacts on rocks. The Carli Suspension Front Diff Guard is one of those things that you have to have if you're going off road. 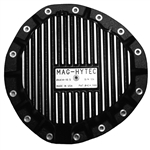 The OEM front differential cover is soft steel and the lip is vulnerable to even slight impacts on rocks.